Join Grow's house band: Boris Latinov on guitar, Jamie Murray on drums, Rio Kai on double bass and special guests on sax for this intimate jazz jam with 2 sets and DJ Jazzintime spinning vinyl in between. These musicians bring you a fresh and energetic approach to mainly a hardbop jazz repertoire with jazz classics and their own compositions. And for those musicians out there, you can join them on stage to jam. From the bar, we have speakeasy cocktails, craft and organic drinks. In the kitchen, we’re thrilled to introduce our new canal side kitchen partners Really Rice - who deliver a culinary experience through a healthy range of rice and grain based dishes, influenced by exciting flavours of the world! They specialise in vegan & gluten-free recipes including flexitarian option (free range chicken), so everybody can enjoy the menu. Find us at Grow, 98C Main Yard, Wallis Road, Hackney Wick, E9 5LN. Just two minutes walk from Hackney Wick Overground and 15 mins walk from Stratford. We're excited to be hosting the launch party of a brand new Brass House band! New Car Smell is a high energy 3 piece group spear-heading the next wave of brass in London. Alex Shaw, Jack Marks and Theo Guttenplan cultivate their sound from a unique blend of Drum 'n Bass, Hip hop, Dancehall and Funk. NEW CAR SMELL takes the sound from their scene and amplifies it to the next level. Impulsive and raucous. Liquid brass. LNZRT, Bad Vibrations and Snap Crackle & Pop are proud to present the return of Test Pressing Festival in association with Loud and Quiet Magazine on Saturday 27 April 2019. Building on the strength of the inaugural year in 2018, the multi-venue festival will be moving to a number of new and exciting riverside spaces in Hackney Wick. Our first home: Grow, Hackney. This eco-conscious venue packs an incredible canal-side sound system just 5 minutes walk from Hackney Wick overground station. The perfect backdrop to bump and groove to the euphoric synth-heavy sounds of True Color's resident DJs. Oh... and it's FREE ENTRY! Thursday night goodness. See you on the dance floor. For Equal Parts' second dancefloor foray of 2019, our residents join forces with basement stalwart and Hansup head-honcho Aodhan. As always, expect to hear only the very finest house, disco and techno melodies. 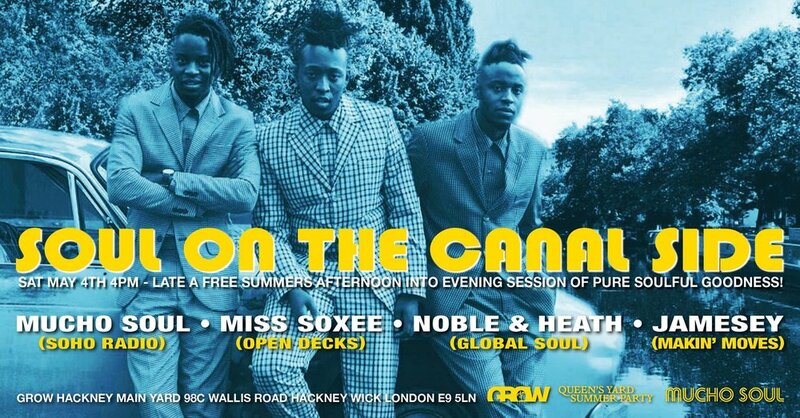 As part of this years Queen's Yard Summer Party 2019, Mucho Soul return to Grow with the first event of another series of special FREE afternoon into evening Soul On the Canal Side Sessions in Hackney Wick. Grow is an independent and self-organised eco-system of studios and a creative space with bars and a kitchen, created out of an old sausage factory by the River Lea in Hackney Wick. We work in partnership with artists, musicians, DJ's and community groups and host a diverse programme of events, including: live jazz and blues, open deck reggae, workshops and talks and art/film festivals. Grow pays London Living Wage, uses eco-electricity, sources ethically and locally and is free entry, wherever possible. We currently serve a seasonal menu and range of drinks, including organic wines and prosecco, cocktails, homemade Hackney Spiced Rum, cask ale and also offer a range of soft drinks including Kompassion Kombucha, Rejuce, Charitea, tea and Union Coffee..
We'll be taking over Grow's amazing canal side terrace during the day with a selection of live acts & DJs, then after dark we move inside with more dancefloor driven riddims + a live electronic act! Hip Hop producer Ohno will be playing live re-edits of classic soul, funk and world rhythms for our MC's to cypher on. If you bang it, beat it, blow it, sing or rap it, Murk wanna jam it with you! Sign up to play and we'll get in touch! The evening begins with a jam warming things up. We encourage everyone to take part of it, if you're bringing your instrument or your energy, please join us. Followed by the guest band performance and then the final jam session of the evening. This is a free entry event, with special importance given to the idea that everybody in the venue are sculptors of the music and art being created. JZ Replacement with Jamie Murray and Zhenya Strigalev is a high energy and intense newly formed project from 2 dominating figures of contemporary Jazz. Having just successfully played the Love Supreme festival, the famous Ronnie Scott’s Jazz Club in August, Berlin and Vienna as well as at London Jazz Festival and Porto Jazz festival in Portugal. This is a fresh exhilarating partnership not to be missed! In December they had an extended tour in St Petersburg and Moscow and they're currently recording a new album, so catch them live to hear some new tunes and grooves whilst they're fresh! JZ Replacement is a very special project and different from Zhenya's and Jamie's other projects. They have lots of inspirations through their musical journeys and studies, and in this project they mix them to create an organic yet very original sound. Some people see their Indian influences, some Charlie Parker or Chris Dave. The focus here is create something very tight and precise (which is often not possible with bigger groups) while being totally free and creative. There are lots of heavy swinging grooves, complex melodies as well as just some catchy simple melodies which will please everybody (although that's not the goal). And they may even RAP some Jay Z. Little Italy Night is back in town Sunday the 12th of May! Special Edition for the BOB MARLEY CELEBRATION DAY. We're over the moon to announce a special fundraising gig with The Heliocentrics! Undoubtedly one of the most incredible things to happen in music from the past decade, the band’s unique blend of raw funk, cinematic psychedelia and sci-fi jazz has earned them a cult following around the globe, counting Gilles Peterson, Madlib and The Gaslamp Killer as their fans! The Heliocentrics are a group for which genres are meaningless and boundaries invisible. Since first appearing on DJ Shadow’s 2006 album The Outsider the group have gone on to release a string of records that float through jazz, hip-hop, psych, krautrock and musique concrete whilst also collaborating with numerous genre heavyweights from Mulatu Astake to Gaslamp Killer. The group’s deep-set ability to craft music intuitively and impulsively stems from a desire to avoid typical song writing processes or generic structures. Since its conception, the band's music has mainly been created from live improvisation. This musical approach gives the band its own sound and identity as nothing has been pre-written or prepared - for anything to happen it must be created at that time from the people in the room, and on the spot. A decade of such well explored sonic adventures has resulted in a tightly knit bond that the group refer to as, “almost a form of telepathy” with “musical changes that otherwise would be near impossible to write…"
The Heliocentrics comprise Barbora Patkova (vocals),Malcolm Catto (drums), Jake Ferguson (bass), Jack Yglesias (percussion/organ), Dan Smith ( guitar), Raven Bush (violin/electronics), Jason Yarde(sax), Sylvia Hallet ( Hurdy Gurdy). Expect hip hop, soul, latin, reggae and more. Proceeds will go to LMHR to allow the campaign to continue its vital work. Love Music Hate Racism uses the energy and vibrancy of the music scene to promote unity and tackle racism through education and events. 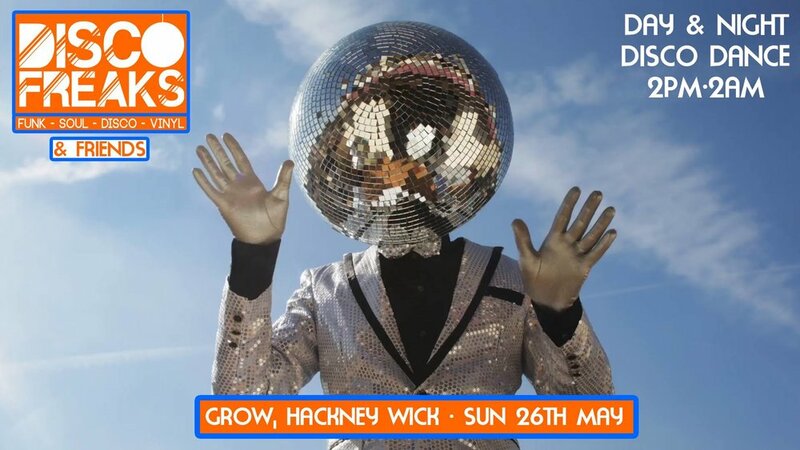 On the 25th of May, we are super excited to announce the first date for our summer residency at Grow, Hackney! For this occasion, we will be spinning records in the terrace till 8pm then we will move inside! 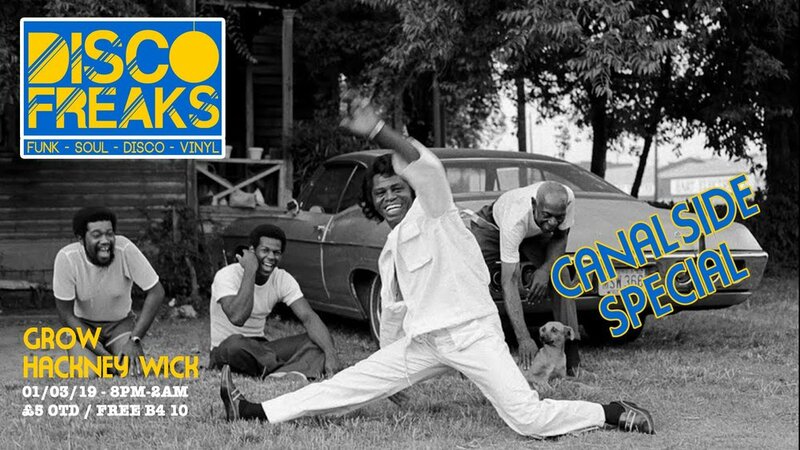 We welcome back with open arms the Disco Freaks for their third annual canal side day/night big old party. To celebrate the start of a massive summer for the Blackburn and Margate Disco Express (including stops to Worthy Farm and Bologna) they’ll be hosting a 12-hour party starting on our canal side terrace and bringing their eclectic record collection inside once the sun goes down - a perfect way to spend your bank holiday Sunday. Also jumping behind the decks when the time feels right will be some very special guests, recruited from far and wide, so look out for those names announced in the next few weeks. We'll be starting things off outside at 2pm & will slide onto the dance floor once the sun sets around 9/10pm. As if that wasn’t tempting enough the event is free up until 10pm (only a fiver entry after that) so we hope to see some happy shiny familiar faces! Head on down for good moments on our garden terrace on the River Lea and celebrate the weekend in with devilishly delicious disco until the early hours. Free entry before 10pm - £5 after. From the indoor and outside bar, Grow has a range of organic wines, cider, craft beers and cocktails and soft drinks. Motherland residents D-Malice, DJ Kitty Amor, Sef Kombo are back with great energy!! SUNDAY JAM // EVERY FIRST SUNDAY of the month!! The Sunday Jam is back with Roots Rock Reggae Dub at Grow! Musicians join together to bring some new music and some well known riddims live on stage! From roots to ska to dub, expect some serious dancing vibes! This April we are happy to bring on stage some of the best international and local artists! For the first time DJ Kullar will be spinning tunes alongside the bonafide Fenomeno Show and all the way from New Zealand Tobi Mafia outta Jafa Mafia! Sinista Eskapone will be rocking the mic alongside the Dubhouse Crew with Sista Grace and Sista Diletta! Don't be late ! Should you want to perform a set or pop on stage for a short set, it's recommended to get in touch in advance. Stay strong and see you there! Grow is a bar, kitchen and creative space carved out of an old sausage factory by the River Lea in Hackney Wick. It is run as an experiment in ethical and sustainable business and works in partnership with local artists, musicians, DJ's and community groups. Most events are free, from live jazz and blues, open deck reggae, open mic and art festivals. Grow exists for music, art, food, conversation, community and belonging. Everyone is welcome. Join in with blues stripped to the bone with London bluesmaster Aidan Connell for an Easter Sunday special edition of this jam night that celebrates the east London blues scene. Live music & DJs till 2am! Country Blues, Electric Blues, Rhythm & Blues! Hard hitting British contemporary rock’n’roll group inspired British Blues rock groups such as The Rolling Stones, Peter Green’s Fleetwood Mac and Cream as well as the early output of Chess and Stax records, approaching these well trodden influences with a fresh approach and much needed urgency.The group met over time at various blues sessions in London, eventually finding the common 12 bar format too constrictive, the group is led by Aidan Connell who Classic Rock Magazine called 'The new voice of London. Amplifiers, microphones and tubs provided. Bring your guitars, harmonicas, tunes and BLUES. Come down to meet old friends and some new ones too. 🔥🔥🔥We're back with our Summer OPEN DECK, vinyl only sessions at Grow, Hackney. If you want to be on the first flyer and attend regularly then drop us a message. We operate a first come first served rule on the DJing spaces. Please message us with any questions. On Good Friday Grow hosts Electric Nougat's Tom Williams (aka Deathbeast) b2b with crate digger extraordinaire Jugin. As always, from the bar you can enjoy a range of organic and craft drinks and a freshly prepared seasonal menu in the canal side kitchen by Slow Fire London. Grow is an independently run space and an experiment in ethical business, which includes working with local artists, musicians on collaborative projects to host free events where everyone is welcome. We pay London Living Wage and partner with community projects to share and nurture local talent. Grow has no investment and relys on the sharing creative economy of the area. Profits go back into the community. We are based 3 minutes walk from Hackney Wick Overground and 10 minutes walk from Stratford. Rave2Save is a charity event raising money for two amazing causes - WWF and Wateraid. DJs will be spinning groovy House, Techno, Electro and Disco across two rooms, which be will decorated in accordance to the theme the charities are associated with - Underwater (Wateraid) and Jungle (WWF). Expect lots of big and colourful inflatables and props. Bobby (formerly Bobby Pleasure) is one of the scene’s busiest players, constantly diving into new projects, such as his latest venture - joining the Fabric family as one of their latest resident DJs. When Bobby isn’t creating waves within the DJ circuit, he is the host of label and promoter, Pleasure Club as well as founding Needs. The latter is a non profit collective, event series & record label which uses music as a medium to spread love, unity and the idea of giving back. Expect a seamless blend of music from all corners the electronic spectrum, delivered with infectious energy. Raincloud Ollie is not one to be pigeonholed; DJ sets from the Greenhouse Culture label boss span intergalactic disco to speed garage, jungle to techno and beyond. Always playing with a no-holds-barred attitude and oozing excitement, this versatile DJ & producer is one to watch. Join us on the banks of the Regents canal as the seminal radio station, Hoxton FM stream their radio show live from 1pm through to close. Frazer Campbell - .elliot project. As usual all livestreamed on Hoxton FM for those of you that can't make it down to this free event! Food is served by Slow Fire London. Middle Eastern inspired dishes using the best of British produce, including an abundance of vegan and vegetarian friendly options. 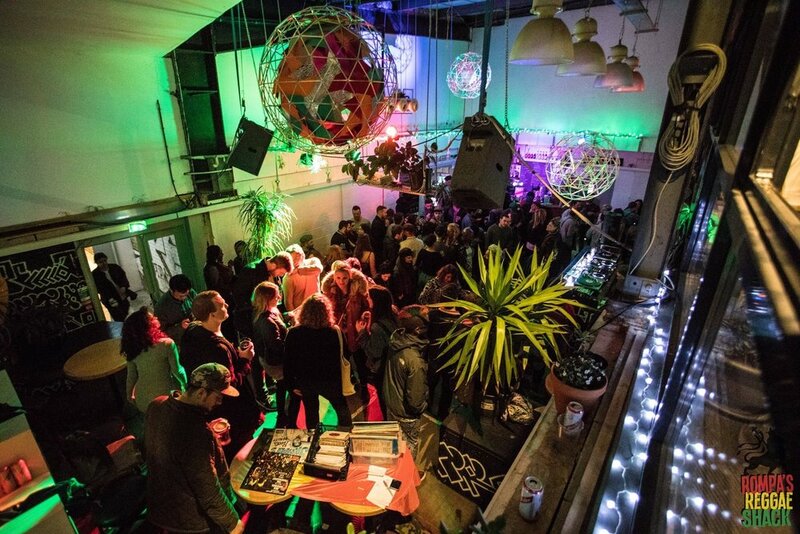 Night Safari is a brand new event launching at Grow in Hackney Wick. Offering a variety of disco, funk and house all night long with an emphasis on world sounds. Providing a varied selection of DJs throughout the night in one of the best spots in Hackney Wick, all set with an ambition to transport guests away from the normality of life in the metropolis to the deep organic beats of distant shores. Expect a twist on traditional tropical club night flavours with a contemporary slice of world music induced dance-floor bangers. We are delighted to launch our debut event at the renowned East London venue Grow, which is an independent canal side bar, kitchen and creative space in Hackney Wick. Operating as an experiment in ethical and sustainable business, it's in perfect harmony with the spirit of Night Safari. This combined is going to make for a wild knees up! We are going to be taking donations for different wildlife charities at each event. This event is for the Giraffe Conversation Foundation and optional donations can be made on the door. This month they bring along Funk band, Jelly Rain as special guests. 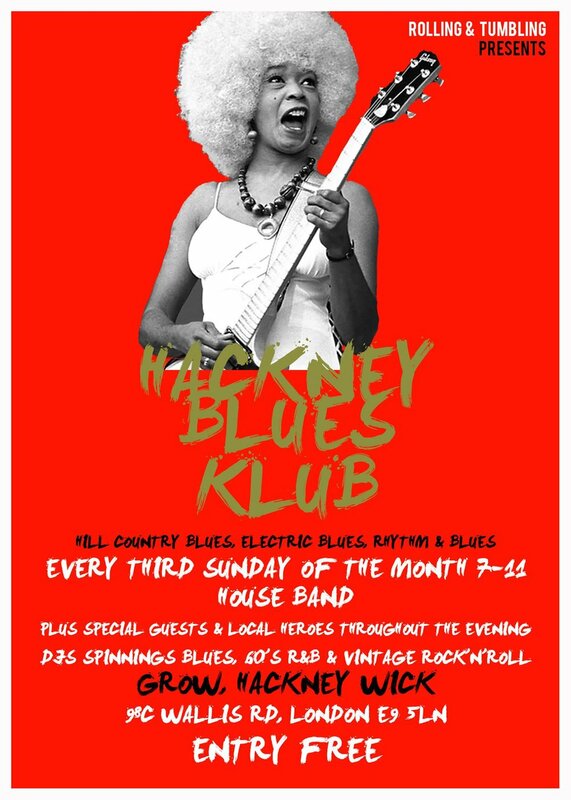 UNDAY JAM // EVERY FIRST SUNDAY of the month!! This April we are happy to bring on stage some of the best international and local artists! For the first time DJ Kullar will be spinning tunes alongside the bonafide Fenomeno Show and all the way from New Zealand Tobi Mafia outta Jafa Mafia! Rassi Hardknocks coming in from Jamaica will be rocking the mic alongside the Dubhouse Crew! Don't be late ! A different kettle of fsh? FUNK // AFROBEAT // HOUSE // GARAGE // HIP HOP and other styles of fsh. House party vibes and merriment. Before we can get to grips with 'a different kettle of fsh' we need to know what 'a kettle of fsh' is when it isn't different. Of course a fsh kettle isn't the kind of kettle you would use to make tea, it's just a fsh saucepan - usually one large enough for a whole fish. The expression 'a kettle of fsh' means 'a mess'/'a muddle' and is often extended to 'a pretty/nice kettle of fsh'. 'A different kettle of fsh', and I have to say it, is a different kettle of fsh. It means 'something different from the thing before'. For example, we might offer to have a friend stay for a few days but remark that a stay of a few months would be a different kettle of fsh. "To enable them to manage their own local affairs will not satisfy Irishmen. What they want is a very different kettle of fsh." SYS Presents Boss Lady Workshop London Take-Over. Hailing from Sydney, Australia, Director of Public Relations firm Stimulated Media and creator of music blog Stimulate Your Soul Margaret Tra is holding a workshop night for the Boss Ladies who are want to enter the music and creative industry. On the night women will be able to connect with other like-minded women to empower and push each other ahead. The workshop will teach women how keep a business in the ever-growing creative industry. How to make your mark as a woman in the business world. Not only will you learn the necessary skills to start a new project but you will have fun doing it as well. It’s about turning your passion into something structural - a business through personal experiences and not some ‘entrepreneur’ BS talk, real women, running real businesses. The workshop will run from 7-9pm, with special guests local Queens Melissa Kains from SISU and Rishma Dhaliwal from I Am Hip Hop Magazine on a panel discussing the their journey through the industry. From 9-12pm we’ll be having an open decks for female DJs, if you would like to participate please do shoot us an email with time slot and mix links. This time-slot/after event party is open to the public. From tastemaker behind the scenes, to pushing her way to the front, DJing marked a natural progression for Maggie Tra. Her background in music stems over several years, starting out as the founder of SYS (Stimulate Your Soul) music blog, which put roots for Maggie as she’s been active in the music industry for over seven years, and continues to support the local and international musicians through her blog, radio, publicity company Stimulated Media and now on the dance-floor. Melissa Kains is the creator of women platform SISU. Sisu is an artistic community providing a platform to showcase womxn in electronic music. We enable this through DJ courses, events, mix series, radio shows and acting as a booking agency for artists involved. The core aims are to diversify male-dominated industries and to build accessible creative spaces. Melissa is also a DJ that goes under the monkier Malissa and has played gigs at Boomtown Fair, Noisily festival and Fiese Remise in Berlin. Supported the likes of James Ruskin, Violent Blondes, Ben Pest, Max Graef, Breakwave, Kim Ann Foxman and Alex T.
Rishma Dhaliwal is a journalist, writer, PR and marketing consultant. With over 10 years experience in the media and music industry she has successfully founded I AM HIP HOP MAGAZINE, started her own marketing brand and co-founded No Bounds a charity that seeks to empower young people. Currently working as a marketing manager for the one of the world’s biggest Bollywood TV channels and working daily on her own brands, she is on a mission to provide a strong platform for real Hip-Hop to live, breathe and grow. Playing in London for the very first time, we will be welcoming to OUTAGE a very talented producer from Brussels, and our headliner for the night, Sifa. With releases on the likes of Kompakt Records, Sol Eterno, Offering Recordings in recent months, this guys hype is extending throughout Europe with a packed schedule, joining Black Coffee in Milan just the other week. A fully sustainable build made completely from an old sausage factory!! You will love it!! Also on the night, we are so pleased to have musician, Peter Ibbetson performing a live set. Certainly not averse to this situation, playing a big part on George FitzGerald's tour in 2018 / 2019, on the drums and synths, plus releasing his latest 'Rivals' EP and his live band set up, this guy is sure to hit the top. Our next guest is London's own Dean Mir, a big part of family run bloop. radio, an electronic music station in the heart of the city. The Avant Garde resident also co-runs the ever popular Interlude radio show and event. A pleasure to have him down. Lastly, but not least, Matt Davis. Singularly flies the Outage flag, with his events and monthly radio shows on Bloop London. He certainly likes to focus on up and coming talent, hosting the likes of David Mayer, Braunbeck, KRANKBROTHER, Casually Here, Kalyma, Peter Ibbetson, Jody Barr, Tim Green, D.Y.A, Gus Emmett, amongst others. So we surely hope you'll enjoy this one!! Entry / Tickets - £5 / £7 available on RA (If arriving after 10pm). Free entry until 10pm if you fancy an early start! Capacity is small at Grow, so advisable to buy tickets in advance or get there at a decent time. We look forward to see you!! Ladies and Gentlemen, girls and boys, music lovers of all ages… Come on, come all! The effervescent, exuberant and ebullient Tarantola’s musical circus is ready to rig its tent on the Lee riverside and unleash its histrionic show! On Friday 22nd March, it’s Thank Grow It’s Friday, a brand-new music series staged at Grow, Hackney and presented by Rhythm Passport, which will lavishly hand out good vibes and quality sounds. On 22nd March, their music will also go side-by-side with that of Monarchee, a French-Korean (but London-based) all-female duo, who will open the night with smooth electro-pop textures and soothing grooves. But it wouldn’t be a circus without its ringmaster. So, to MC the night and set the cruising speed for the party, we have called a good old friend of Rhythm Passport, DJ Lou Pino, who will have you dancing to his tropical, Latin and up-tempo vinyl-only collection. Come on, come all, the circus is in town! Come in from the busy London streets and hear some soul-baring music, insightful lyrics, epic stories, great banter and the warm Grow vibes we've all come to know. Grow is a a space to experiment.... A place to come down without pressure to enjoy a range of musicians from across London who span genres. Local musician Brian Kelly (covering for Joel who is on a four month hiatus down under) will take care of you on the night, whether you're playing, singing, speaking, reading, thinking aloud or just sitting back to relax! Join in with blues stripped to the bone by local garage blues band 'The Dublo' and London bluesmaster Aidan Connell for a jam night that celebrates the east London blues scene. And What events celebrate the eclecticism of music of black origin, incorporating cross genre collaborations, live improvisation and dynamic line ups to create the ultimate showcase event. The bass music producer will be bringing his live electronic inflected beats for a heavy hitting hybrid cross genre DJ/Live set. Our favourite Hip Hop producer, Ohno will be playing live re-edits of classic soul, funk and world rhythms for our MC's to cypher on. And What resident DJs provide the soundtrack with multiple sets thoughout the night. The pair have an equally extensive and eclectic tune collection, expect anything from nu jazz & funk to house & bass music. Grow Presents Elements – A five part audio/visual series, exploring the 5 elements that make up the universe and our own existence – Ether | Earth | Water | Air | Fire. Curated by TribeLife’s founder TIMANTI / Steffie Timanti & visual artist Bless Elska. They will visually and sonically interpret one element at each event. Launching the series with Part I : Ether or Spirit. 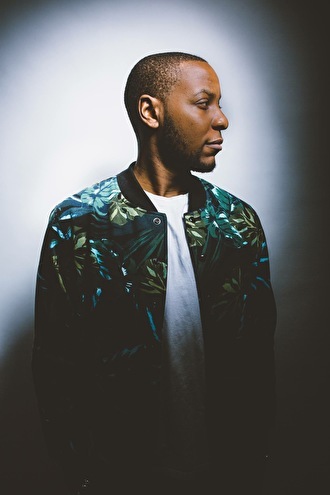 Opening up the space will be London based DJ and producer TSHA. This exciting new talent has created a sound that is diverse and intricate, giving foundation to her unique personal style that draws on influences from the likes of Bonobo, Jon Hopkins, Floating Points and Four Tet. Followed by an extended 4hr set by TIMANTI / Steffie Timanti exploring the spiritual melodies that fabricate between the beats and transcend clubbers beyond the dance-floor into ethereal realms. Join Grow's house bands: Boris Latinov on guitar, Jamie Murray on drums, Rio Kai on double bass and special guests on sax for this intimate jazz jam with 2 sets and DJ Jazzintime spinning vinyl in between. The world music magazine, Rhythm Passport are always looking for new ways to support and spread the word about quality and meaningful music and give you chance to listen to it. So, we are more than excited to invite you to the first episode of 'Meet & Greet with the Album', their brand-new music series in collaboration with Grow, Hackney. On Sunday 10th March, you are all welcome to spend an evening on the River Lee shore in the company of "Do Not Be Afraid" and its mastermind Bex Burch, bandleader of Vula Viel. Don’t miss the opportunity to discover some “new classics”, starting with the finely chiselled and eclectic second work of Vula Viel, which ranges from traditional Northern Ghanaian rhythms to jazzy arrangements, and a minimalist and avant-garde approach to influences embracing the entire world. Throughout two hours (between 7.30PM and 9.30PM), you will enjoy a listening session of the latest LP of the London-based trio, guided by Bex’s words as she discloses the inspiration, themes and secrets of the album, culminating with a Q&A with the musician. Grow presents an evening of live Senegalese Blues music! Headed up by the truly remarkable Senegalese blues outfit Abdoulaye Samb Minnjiaraby. Their infectiously energetic music draws elements from the rich Fula tradition interwoven with Rumba, Mbalax, Afro-Latin and deep blues. Abdoulaye began music by the beaches of his country, fabricating his own instrument from scratch, with fishing lines as strings. He has since gone onto tour festivals around Europe. Warm up acts to be announced! Celebrating the sounds keeping the universal dancefloors grooving, we bring handpicked DJs to Grow every now and then to sonically dazzle and induce some serious shape cutting. Expect dance music from around the world, disco & electronica! DISCO FREAKS // FUNK, SOUL & DISCO FEVER! After packing Grow out with their Day & Night End of Summer Party in September, the charismatic duo return with a whole new batch of funk, soul and disco fever! The boys will be doing the thing they love more than anything else; bringing it hard and direct to the dance floor to get you moving that thing in the spirit of Studio 54. Free entry before 10pm & £5 after on the door. Brian will be opening up the night, having the chats, and doing a selection of stripped back tunes from his various eclectic projects which range from Irish Traditional to Afro Indie and Modern Electronic. Formerly a 3 piece, Jackson released 2 EPs under the name ‘Swimmers’, (Swimmer’s Year 2013, This Burning Circus 2015). Jackson moved to London in late 2015 and with no bandmates was left reconfiguring Swimmer’s songs into acoustic versions. After a year of songwriting in 2016, he leapt back onto the gig circuit in 2017 with the help of a couple of friends in London’s alternative-folk circles (notably Knoxville Morning and Rob Corcoran) and hasn’t looked back since. Niall will be debuting some brand new material on the night! In an age of pop plasticity, the music of this songwriter sets out to define his own form of originality with authenticity. Daniel cut his teeth in the musically vibrant city of Nottingham and has played in various guises for ten years, most recently with former Folk outfit Delta Sun. He has shared stages with artists such as Jake Bugg, Natalie Duncan and Manieres Des Bohemians. Daniel (possibly with some band mates in tow) will be playing songs from his wonderful album The Town and The City. After a well earned Christmas break, the Rio Kai Quartet returns in 2019! Join Boris Latinov on guitar, Jamie Murray on drums, Rio Kai on double bass and Tamás Gyurcsó on sax plus special guests for this intimate jazz jam with 2 sets and DJ Jazzintime spinning vinyl in between. From the bar, we have speakeasy cocktails, craft and organic drinks. In the kitchen, we have Slow Fire London whose menu is inspired by middle eastern flavours combined with the best of British seasonal ingredients with BBQ and sharing mezes at it's heart. The meat is British and hand selected from Smithfields market, as is the produce from New Spitalfields market. The menu includes vegetarian and vegan options. Slow Fire London sources locally and sustainably wherever possible and the menu is freshly prepared. They are also committed to 100% compostable cutlery and crockery. Join Equal Parts as they mark the transition to 2019 with a residents party at their Hackney Wick home, GROW. Grow is an independent and self-organised eco-system of studios and a creative space with bars and a kitchen created out of an old sausage factory by the River Lea in Hackney Wick. It is run as an experiment in ethical and sustainable business and works in partnership with local artists, musicians, DJ's and community groups. Most events are free, from live jazz and blues, open deck reggae, open mic and art and film festivals. Grow pays London Living Wage, uses eco-electricty and sources ethical and locally wherever possible. Grow, 98C Main Yard, Wallis Road, Hackney Wick, E9 5LN. Just 5 minutes walk from Hackney Wick Overground and 15 mins walk from Stratford. Gemini is a contemporary jazz trio with a hint of progressive rock, blues and African music. They made their official live debut at “The Half Moon” in Putney and will be releasing their first single at the beginning of January. We respect your privacy and we will not share your information with anyone.